Serve on a festive plate to add to the playful theme. 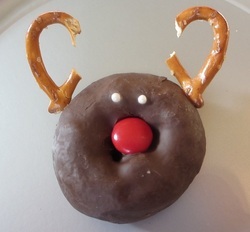 Kids love to help decorate these Christmas treats. To make these Christmas treats bake a large batch of Rice Crispie treats uncut in a big pan. (Doubling the marshmallows works best for these kids treats.) Then cut into fun Christmas shapes like wreaths, trees and ornaments. You'll need to do some molding with your hands as well to round out the edges. Decorate with frosting and candies. 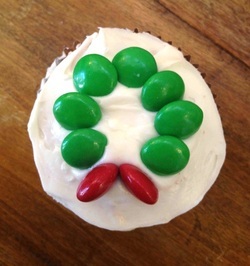 These make cute mini Christmas cupcakes. Peppermint brownies are always a crowd pleaser. These are sure to bring a smile Christmas morning. 1. Bake cupcakes a day ahead and let cool. You can also freeze them. 2. Pick up Redhots and chocolate covered raisins plus mini marshmallows for decorating and red and white icing too. 4. This is a great accent treats. You can make a few them and surround them on a plate with smaller cookies. Be a ballerina and dance along to Prima Princessa shows featuring world-class ballet performances, an animated ballerina and dance lessons with students from the School of American Ballet. Shows are for ages 3-6 years old. "Prima Princessa Presents The Nutcracker" makes an especially great gifts for girls for the Christmas season. You will love this The Nutcracker for kids show!